I told you before that I’ve been hitting the slow cooker hard these days. There’s just so much satisfaction in not having to prep a meal when it’s meal time. 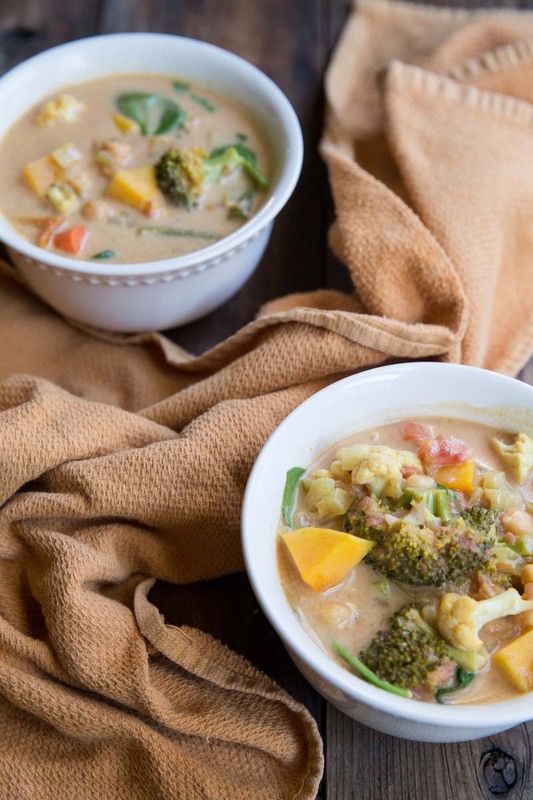 I’ve been experimenting with lots of veggie recipes and this Slow Cooker Vegetable Curry has definitely been a favorite. Just a pre warning… although the recipe is made in a slow cooker there is a tad bit of work. Nothing mind blowing I promise you, just a few steps that you can do in the morning, the night before or during nap time. Plan on some time to chop up all of the veggies, 15-20 minutes tops (or you can buy pre-chopped or frozen which will save a good amount of time). And plan on 5-10 minutes for sautéing the onions and seasonings. That’s it! Simple enough, right?! When I pray, I often get side tracked. While I’m out for a walk or run, I usually go through my list of close friends, family and other requests which gets interrupted often by my wavering thoughts of what am I going to make for dinner or did I forget something on my to do list etc etc. (At least the dinner question is answered when I have something like this already being made in the slow cooker). I’m so easily distracted and too often filled with just prayers of request with little praise and gratitude. I was challenged recently by this Tim Keller Podcast to simplify my prayers. Keller goes through the basics of the Lord’s prayer to help us pray. He specifically highlights the importance of praise. When I pray, simply like this, and with more praise, then the requests I have don’t seen to big or too overwhelming. Father, hallowed be your name, your kingdom come. When we don’t know what to pray or how to pray, it’s always good to remember verses like these that can guide our prayer life. And since 2015 is the year of Simplicity for me, slow cooking and simple prayers are just the way I’m choosing to go! 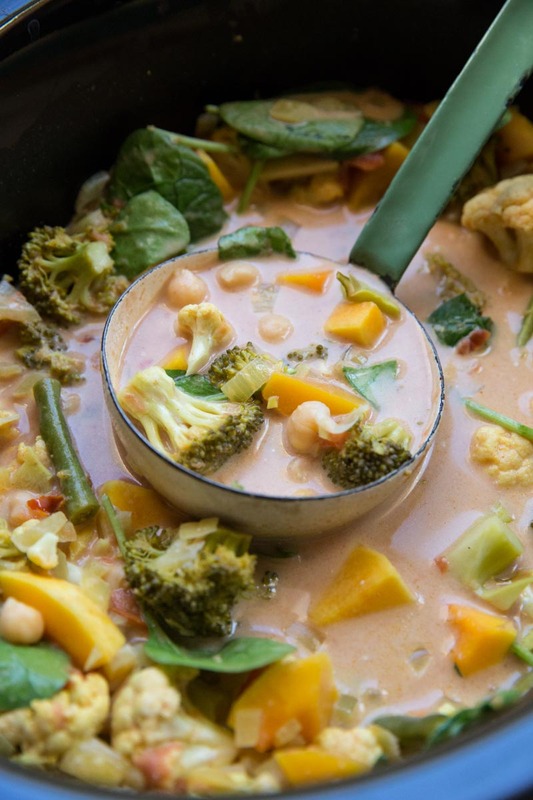 A healthy slow cooker recipe with tons of vegetables in a creamy coconut curry broth. Saute the onions, garlic, and ginger in oil over medium heat for about 5 minutes or until onion is translucent. Add 1/2 of the salt, cayenne and curry. Cook, while stirring, for 2-3 more minutes. Add 1/4 cup of the vegetable broth to get all of the bits of seasoning off of the pan then add this to the slow cooker. 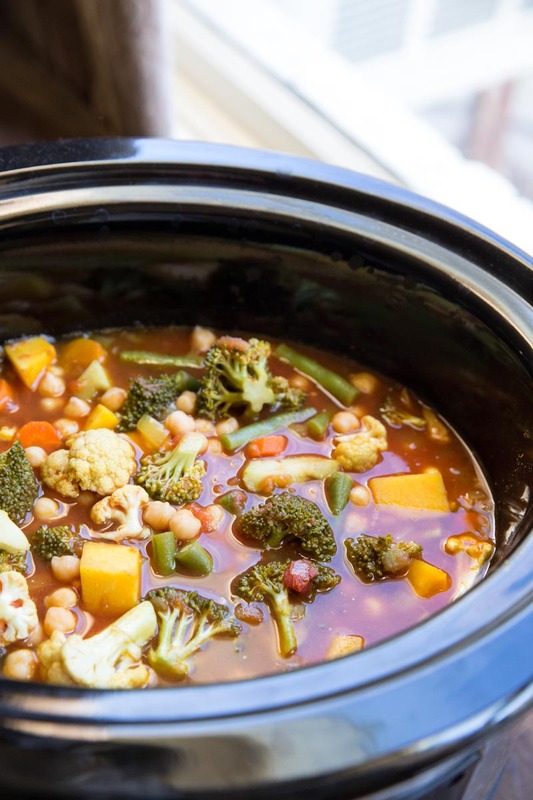 Add remaining broth and remaining salt to the slow cooker, along with drained chickpeas and tomatoes with their juices. Add in all of the prepared vegetables. Cook on low for 6 hours then add in the coconut milk and spinach. Cook for another 10-20 minutes or until spinach is wilted. Then serve over rice, quinoa or by itself! Almost any vegetable may be used here. 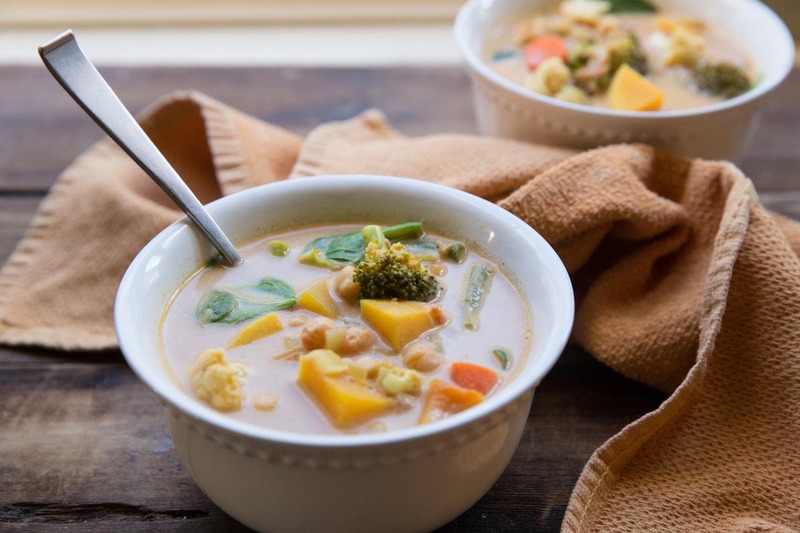 I use 1/2 head cauliflower, 1 stem of broccoli, 1/2 butternut squash, 1 cup green beans, and 1 bell pepper) Potatoes also work well as do root vegetables, carrots, eggplant, zucchini and probably just about whatever you have on hand. Frozen or pre-chopped will cut back on the prep time. Your recipe doesn’t say when to add the vegetables. I’m assuming with the chickpeas and tomatoes. Oh dear! I’m so sorry! Thanks for bringing that to my attention!! I made that change and yes, you were right on when to add those in!